Our old pal over at the CM Press is fuming - again. In his most recent post he provides his loyal readers another statement of his displeasure with the city council. I'm sorry, but I just can't help but smile. It seems that the majority on the City Council are still just not jumping high enough or fast enough when he tells them to! Now he's referring to them as "Eunuchs", and bemoans the fact that - in his view - once elected "these individuals" become part of the status quo establishment. Awww, what a shame! The translation is that once elected, the politicians realize they have responsibilities broader than Your Neighbor's narrow, bigoted plans and, on occasion, act accordingly. However, it's apparent that our old buddy isn't happy about it. The next thing that he will do is, once again, threaten them with "un-election", the way he did with the pathetic Chris Steel. During his rant in the Public Comments section he misquoted former Parks and Recreation Commission Chairman Byron De Arakal on the issue of neighborhood parks. Of course, that doesn't surprise me, since this guy has never seen a truth he wouldn't bend for his own purposes. If you believed him, every small, neighborhood park in the city is overrun with marauding soccer players, crossing the border from Santa Ana to accost our residents as they peacefully meander through the parks. What a crock! There were a few high points last night. For one, Wendy Leece stood up to the pressure applied by Mansoor and Bever on the moratorium on residential condo conversions. She stubbornly, and rightly, fought off Bever's attempt to include eight of the twelve projects already in the pipeline in the moratorium. After much arm wrestling and debate the issue finally received the 4/5ths vote necessary because it was an urgency ordinance. Katrina Foley was absent, which gave Linda Dixon some serious power for a change. She and Leece had the guys boxed in and the vote finally went their way and the dozen projects in the hopper are excluded from the moratorium. Because of the stalemate, the only other options were to either just receive and file the report, quashing the moratorium or to continue the issue until Foley returns. As an aside, there was a little poetic justice on the dais last night. When the council was seated Dixon took her new "seat in exile" on Mansoor's right hand side. Leece took the seat between Bever and City Manager Allan Roeder. All night long Leece continually leaned and twisted to hear what was going on and had a real struggle communicating with the City Attorney, Kim Barlow. It was a perfect example of the old adage, "Be careful what you ask for!" Also, the lighting on that side of the dais is such that it cast Leece in a very unfavorable light, so to speak. Also, there were some strained words between Dixon and Mansoor, who snapped at her when she pointed out that he was ignoring her requests to speak. Of course, how could he have known she wanted the floor when his back was turned to her much of the time as he chatted with Bever and Leece! And, at one point when our young jailer/mayor was having time keeping track of exactly how many projects would be included in the moratorium - I think he ran out of fingers - he said, " I'm a politician, not a mathematician." Funny, I thought he was a deputy sheriff and jailer who dabbled in politics. Guess he has a different view. Stay tuned. It's very likely that Your Neighbor will be so angry at one of these meetings that he may just explode, his head bursting like those Martians in "Mars Attacks". Ack... Ack, Ack, Ack! One of the many volunteer (that’s for you Byron) activities I lend my time to is AYSO soccer. As A coach and assistant coach, I know first hand that these rogue groups (mainly Hispanic) will, without regard for the children in the area, take over parks for their games. Even at large park identifying themselves with rule that state this is not lawful, it happens. They do use intimidation and they do lack respect for others. If a passive park is for other use then sports, then I think for safety reasons this is a valid concern. Running over small children or just people using the parks for pleasures should be dealt with by the city with penalties to cease this behavior. The guy (your neighbor) may rant about many things but some of his rants are valid. Can everything stop being about race and can common sense be placed somewhere in the forefront? the council meetings are much easier on the ears (and eyes!) without Foley there. Could we hook her up at home from now on. If we had done such a hookup earlier then we would not have had this mess with seating--the fact is, nobody wanted to sit next to her and face her cross examinations from a foot away. Thanks for the rational and very appropriate post. I agree that some of what Your Neighbor says gets lost in his delivery and other views, but his soccer point may very well be valid. I have been to Canyon Park on a weekend and it was filled with soccer players. It is a policy issue that the City has been wrestling with (more athletic fields) for some time. Unfortunately, soccer is very land intensive use, and we are a pretty built out city. Your Neighbor DOES have a point - if I tried to go play soccer at any park in Newport Beach without a permit or against park rules, the ranger would ticket me. Small, passive parks are not for group sports, and the Park Rangers should vigorously enforce the rules in order to keep the parks enjoyable for everyone. Also, group sports take a toll on landscape that is not designed for that sort of intensive use. Its simply a matter of respecting the rules. zenofobe, that was a nice, high-class comment relevant to nothing. Of course, most supporters of the current majority obviously feel that the city is better served by five bobblehead dolls up there, all nodding in agreement to every boneheaded scheme the mayor proposes. I'm glad Katrina is there to provide some well-reasoned, articulate views. Your comment, "the fact is, nobody wanted to sit next to her and face her cross examinations from a foot away." is very interesting. It looked to me that Leece was benefiting from that proximity. Silly me to believe that she actually wanted to sit next to Roeder. I think the mayor just wanted her away from Foley because he could see that she was, indeed, becoming contaminated with common sense. Thanks for participating. Please check your calendar. Your post is obviously four days late. 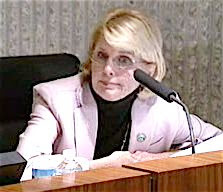 As for Councilwoman Leece appearing in a bad light, that was both literal and figurative I assume. Quite frankly, I believe her acrobatics were a bit more animated than necessary to PROVE that she was using her new seating position and it was worth the effort to accommodate her. The clown over at CM Press really only cares about the park next to his house. He includes all passive parks as a dodge. In fact his only concern is keeping anyone who is not to his liking out of his neighborhood and city. That should be obvious to everybody. The fact that some percentage of the people he hates are also less than model citizens doesn’t in any way diminish his distasteful obsession with eliminating from our community those with ancestral roots different than his. DVS - your comment about "your neighbor" does not get to the hart of the matter. Regardless of his views, your views, my views, there is an underlying issues in CM, regarding parks and many otrher things. Robs comments are right on the money, its about respect. People that don’t play by the rules negativly impact the rest of us, be it with their presence at the park or the mess of the fields left behind, it’s an impact. Please drop the hatred of him and the council for a minute and look at the underlying problems he brings to the surface. We all can make fun of someone on blogs or posting online, but this guy does have the nads to get up and speak his mind, that is a lot more then even I can say. Geoff I know you want change in this city and so do I. If we all are to reach across the isle there needs to be less rhetoric and more substance. If people approach things with fact and numbers to back up their positions most level headed people will listen, but when everything is spitballs and trashcans then who cares. I know I am guilty sometime of this, we all get caught in the moment or frustrated with what is going on. I actually read your posting about being more civil on the blogs and agree I can do better in this area. If we have a more intelligent argument, dialogue or debate we can probably find common ground to work toward. 1) I live near a park on Bear Street and the 405. I am a frequent visitor to the park and I pass by it frequently during the week and on weekends. It has a large area that is used for playing all sorts of games in and hosts many birthday parties. I have yet to see a problem with one group bullying another. 2) My children went to Paularino School. Again, we had many opportunities on the weekend to observe activities at the park next door. We never saw nor experienced any problems. Those are the facts as I know them. Please provide facts that you KNOW that would indicate we have an out-of-control population that needs to be reigned in and that the park rangers are not currently doing their job. As I see it, there is no more of a problem with behavior in Costa Mesa than anywhere else. Yes, I am sure that there are occasional instances where two groups have a disagreement regarding who has priority over the use of a public resource (in this case park space). I would hope that as civilized members of our community that they would work through such disagreement. When that course of action is not satisfactory, each or both groups has the right to contact the city for assistance. How does any of this equate to a citywide problem of “soccer teams taking over our passive parks and endangering citizens who want to use them for their proper purposes” as stated by CM Press? As an aside, the admonition that “No person shall fly a kite…” is in my mind oppressive. I am often heard counseling others to “Go fly a kite”. We need more fields. If people are playing soccer where they shouldn't be, that pointsto two problems - 1) lack of space, and 2) disrepect for rules. The CM Press laughingly associates people "playing" a sport with menacing maliciousness. What isn't laughable is when a small park gets taken over by adults playing a game that involves running and kicking a ball. CM Press may be really concerned about his park only, but he does raise a good point. I remember reading an article about the Santa Ana Parks staff complaining loudly about the fact that their fields get such heavy unauthorized use that the grass is eradicated and once grassy parks are now barren dusty wastelands. I completely agree that we need to take the high road here and examine the facilities we have and the appropriate uses for them. A park like Canyon Park (or Pinkley Park, or Shiffer Park) is completely inappropriate for soccer (just as it would be for baseball, polo, football, or rugby). For City Staff to ignore an issue which is obviously contentious is a problem. Your observations (not facts) are what you were privy too. I know my kids do not play at Te Winkle Park, the park by which I live, because they have been mowed over. Not only is this my account but they and their nana had the same experience. I can only speak to what I see and know. When I am with my kids or coaching and responsible for other people children I must error on the side of caution. These adults that play soccer are not gangs and for the most part are not intentionally looking to cause harm. But if my son, who was 3 last year was told he could not play with his 12 inch battery operated boat in the lake a TeWinlke park, and there is not law or statute posted forbidding it, just some Park Rangers attitude stating that he says my 3 year old could not, then why can’t parks that are not appropriated for team sports be left passive? You can’t pick and choose. As for the difference between CM and anywhere else, I live in CM, so I expect more from the city where I live. Maybe you should too.